Had a good swim. 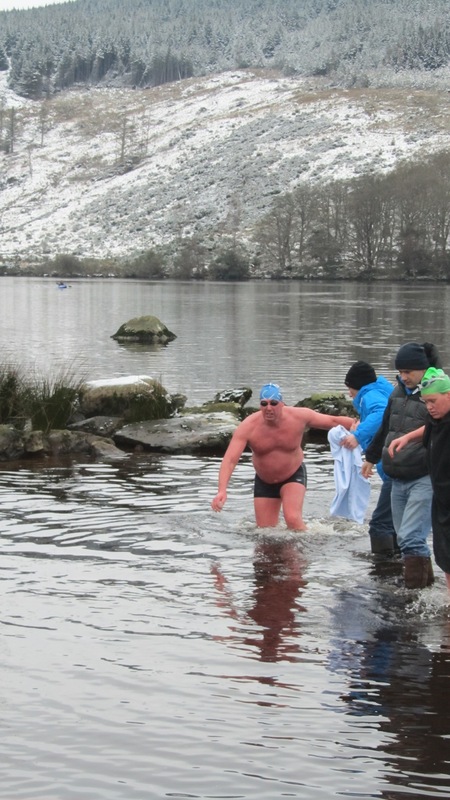 The mountain setting of the glacier-formed Lough Dan (Co. Wicklow, Ireland) was spectacular, like a scene from “Lord of the Rings”, and the snow on the ground and the shoreline ice film really made it a true “Ice Swim”. Needing 5.0ºC or less for our mile swim, water temperature varied from freezing in the shallows to 3ºC in a foot of water: it was what we both wanted and didn’t want at the same time. There wasn’t much room for smiles when you know what’s ahead. Breakfast of muesli, toast, tea and juice was augmented by 7:30 am lunch of soup stew and roll, followed by some pre-swim sandwiches and chocolate bar and by now not-warm-enough energy drink. Anything to help fill the stomach for energy and to ward off the cold. Pre-race advice from my fellow swimmers, John Daly, Colm Breathnach, Donal Buckley, Carmel Collins and Fergal Somerville – the organiser of the Eastern Bay Swim Team Invitational Ice Swim – was that the swim would still be there again and not to take on more than you “wanted” to; while my well-meaning brother John Paul’s voice of reason was to not feel pressured into it either. The nervous energy before the race was immense. Within 3 seconds of hearing from Fergal on Thursday that the race was scheduled for the weekend, my heart rate jumped 30 or 40 beats, the adrenaline kicked in and my whole physical and mental demeanour changed from what it had been just a minute before. 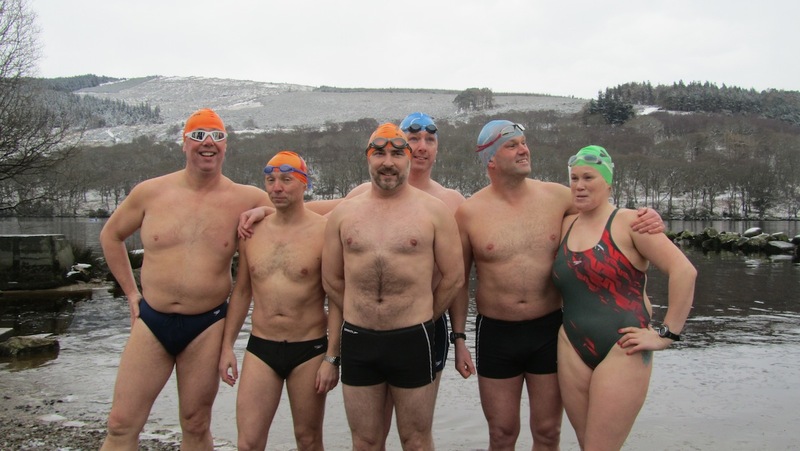 Thankfully, this had settled by race day – Sunday, 24 February 2013 – and the fact it was our second attempt at an International Ice Swimming Association swim seemed to make it easier to face. Since the Association was started by South African, Ram Barkai, in 2009 and there are less than 70 Ice Swimmers worldwide. Having a mandatory ECG completed with fellow High Rock swimmer and medic for the swim, Dr. Nichola Gilliland and paramedic and champion English Channel Swimmer Tom Healy on hand, I was as ready as I was going to be. Someone asked if I was going to do half of the distance or all of it – I said “all of it” – because you have to start knowing that that’s what’s involved and not let the doubt in. If we were in trouble or slowed up too much, such as changing to breaststroke, the safety boat would take us out, no questions asked, so you had to put a bit of trust there and hope it didn’t come to that. Cold initially and gasping for breath, you just get in and get on with it. Didn’t have the right line to the buoy on the first length, heading for the wrong snow covered treeline, but Fergal nudged me to indicate we should aim more left and after that had no trouble sighting. The high-vis vest that I’d asked the safety kayaker to tie to the buoy helped make it stand out. 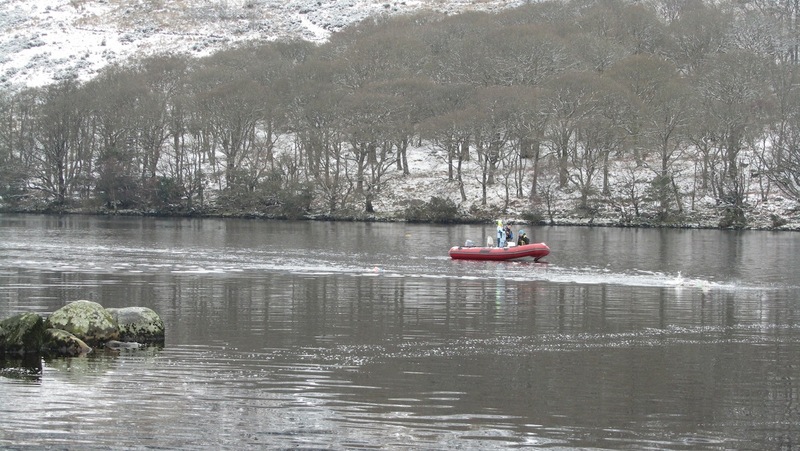 Three of us arrived at the first buoy together and I thought there’s no need for the usual open water race “argy-bargy”! I did all the laps anti-clockwise and I was glad to be meeting the others going back and forth on our eight 200 m lengths. Once the breathing settled down after the first length, my body felt wrapped in a blanket – like the line in the Pink Floyd song “I have become comfortably numb”. The body’s self-protection mechanism of holding all the blood close to the heart and vital organs was working. Hands had pins and needles and feet cold and my mouth full of cold water too. On lap 3 noticed that my hand (was only looking at the right one as my breaths were coming thick and fast) was glowing red underwater, like the colour of salmon. This worried me, but above water it looked ok, so ploughed on regardless and thought it’s a trick of the light or the bog water. I have been clenching my fists on each “catch” part of the stroke and sometimes on the recovery too which would not be the most efficient. The thought of my hands that colour and the pins and needles feeling convinces me that I am as well to keep clenching, even though overall it will mean more time in the water. On lap 6, at about 1,150 m, the blanket that was keeping my body numb just evaporated and the cold hit me from the shoulders down, like Mr. Freeze. This wasn’t good, as last month on our first (warmer) Ice Swim attempt at the Bull Wall the comfortably numb feeling started to partly wear off towards the end, whereas this time it just vanished in a split second. Again, the body telling you something, just no time to wonder; what? A few strokes later I met Fergal coming towards me and he put the head up and shouted some encouragement. Laps 7 and 8 were a bit more hazy, my mind was more blank (no room in the head for songs or thoughts – I had been saying Hail Marys up to this) and kind of had the feeling that I was drifting off to sleep. The brain was obviously in shut down mode, although I knew to spot for the buoy and the pontoon. Saw the RIB with Skipper Barry, the Scout Leader, at various times on the odd-numbered lengths, standing off. I could feel the strength in my arms, I was on automatic and it was the strength of swimming kept me going, because I didn’t have to think about that. Temperature on my watch on my wrist (which adds about a degree) during the swim was 4.4ºC , as against the 6.7ºC the last day. After touching the pontoon to finish, the shallow water was a bit of a struggle as I couldn’t swim or stand up, so tried to push forward into shallow water as best I could get. Some of the guys, including Tom, were standing in a few inches of water, but I didn’t think they’d come all the way in after me! Unsteady on my feet and not able to do anything for myself, the three guys (Colm Dunne, fellow lifeguard, Cian Connaughton, sea swimmer and fellow NAC Master, and John Paul) I had helping were great and got me wrapped up in my first change of clothes and 100 yards up the snowy track to the car. I remember a lot of that, giving directions and giving out, but seemingly I said a few times that I couldn’t see clearly. I think this was more to do with my brain being in retreat rather than any pain with the eyes. They got me in the car and the body heat of Colm and John Paul hugging me helped calm the fierce shivering and intense cold as I couldn’t even feel the heat off the car heater which they said was blasting out. After a few minutes, we went into the Scouts’ canteen barn and did a quick change into my dry second change of clothes and back in the car with some hot water coke bottles and advice from John Kenny, safety officer (and my lifesaving instructor when I was 11 years old). When I had surfaced after this, everyone had left, but I was in no state to see anyone anyway. I had seen Fergal through the car windscreen and he looked a funny shade of purple, but otherwise okay. I was back to normal by the time we were on the M50 heading for home. Last night (30 hours later) and today, my skin is feeling a cold burn. It’s a bit red and feels like sunburn and the skin and muscles are a bit sore too. I had this before from a snow swim 2 years ago, but this time it doesn’t seem as bad … yet. All told, it was a pretty extreme experience. At 31 minutes 25 seconds, it took approximately 33% longer than an equivalent pool swim. It was a bloody tough swim, an achievement that took all my mental and physical reserves … and then some! A special note of thanks reserved for my wife, Alice, and baby, Matthew, for their constant support of my swimming adventures and again to all the support teams, the medics, the organisers, the Lough Dan scouts and especially to Fergal Somerville for making it all happen and for the invitation to take part. Well done to Patrick on a great swim and a big thanks from me for letting me post this on the blog. I would usually direct readers to the guest’s blog but Patrick doesn’t have his own one … yet! In any case, we’re all looking forward to hearing more from him.